Volume, and goals, trump accuracy. As we will discuss below Kerry’s point taking was very poor (not that they will care now!) but their ability to carve out goal chances (or be granted them) and convert those chances saw them through. They had four attempts at goal scoring 2-01. Donegal had three, including two in that last minute scramble, and scored nothing. So perhaps more accurately it was Kerry’s goal shot accuracy that trumped Donegal’s point taking efficiency. This was the one area that stood out to me whilst watching the game. The majority of categories in the above table are quite similar. Attacking possessions originating from kickouts were the same whilst Kerry slightly edged the attacks from turnovers. Nothing that would definitively swing a game either way. But then there was the “other” category. On four separate occasions Kerry regained the ball after one of their shots went astray. Three times they scored from these. It is almost like the “hidden yards” that NFL teams gain from their special team units. Unseen, unglamorous work that reaps huge benefits. Think of Kerry’s initial burst – P Geaney plucked O’Brien’s skied shot from the air for his goal. He again reacted first to Buckley’s blocked shot to knock the ball down to O’Donoghue in space for an easy point. Nothing spectacular but both scores could easily have been nullified. On the other side Donegal only once created an attack from a shot and that was the last play of the game when McFadden fisted McBrearty’s blocked shot onto the post. Kerry had four shots at goal scoring 2-01.Although one of those shots was laid on a plate that is still not an insignificant achievement. The volume of goal shots allowed by Donegal this year was 1, 0, 2, 1 & 5 (vs the Dublin goal machine). In fact the only other teams to produce more than three goal shots since the start of 2012 are the aforementioned Dublin and Mayo in the 2013 quarter final rout. Of course if Kerry hit 75% on their goal shots their point taking must have been atrocious. And it was. They converted 17% (4 from 23) of their attempts with a weighting of -5.603. They had 16 attempts at a shot from what might be considered outside the scoring zone and converted two (Murphy’s sublime effort from the right and Buckley late on from the left). Two! This from a team that had converted 57% of all point attempts in the run up to the final. Some of that lack of accuracy can be applied to Donegal. They applied pressure to 63% (10/16) of those shots outside the scoring zone. Indeed excluding Johnny Buckley, who had the knack for finding pockets of space – he managed to take three shots with no pressure – Donegal pressured 77% of those more difficult opportunities. On top of that Donegal restricted O’Donoghue to one shot. Goals, and goals from individual errors, are a killer. Donegal were much more efficient than Kerry but that isn’t saying much. They were still below average. They only managed 5 shots from play in the first half with the first not arriving until the 24th minute when O’Connor’s goal attempt was saved. They were much better in the second half, managing 13 shots for a point but again their accuracy was nowhere where it needed to be. They converted 46% (6/13) but really, off such a low base, they needed to be in the high 60 percentile to catch up with Kerry’s goals. Again we have to credit the opposition’s defence here. Kerry were stout not allowing Donegal a goal shot in that second half until the last minute scramble. They did this without fouling either – as noted below they didn’t concede one foul inside the 45 during the second half whilst also pressuring 69% (9/13) of Donegal’s point attempts. Both team’s free taking was essentially average although both Sheehan (the late free from the right sideline) and Murphy (a sideline attempt in the first half) both had one attempt with a ridiculous degree of difficulty. The rest of the deadballs graded out as expected with the four shared by McFadden, BJ Keane & P Geaney all relatively close to goal. Kerry’s defensive discipline – or lack thereof – was giving Donegal an easy out in the first twenty minutes. Donegal had five attempts from deadballs, converting four (the aforementioned sideline attempt being the only miss), before they had a shot from play. But that changed in the second half with Donegal only having one attempt from a free and that occurred outside the 45. A quick note on Brian Sheehan’s free towards the end. I have, on more than one occasion, been concerned by Kerry’s inconsistency in free taking but the old adage of “form being temporary and class permanent” was never more apt. To come off the bench and deliver that strike was simply brilliant. A relatively low turnover count with possession being key. Indeed Donegal went over six minutes, from Christy Toye’s point in the 65th minutes, without having possession of the ball outside of Durcan’s kickouts. Such was Kerry’s discipline & control I only tagged them for six turnovers in the entire second half – and one of those was Moran’s shot that hit the post. The overall numbers look very similar. Of course this depends on viewing the pivotal turning point in the second half, Durcan’s short kick to Donaghy, as just another score. It was much more than that. When you are a short kickout team giving the opposition the ball in a very attacking position is an occupational hazard. It is however rare. On 28 short kickouts in the previous five Championship games the opposition only gained the ball twice from Donegal short kickouts and didn’t get a score either time. It was not as if the Donegal kickout wasn’t working. Before the Donaghy goal Donegal had taken nine short kickouts and scored 0-04 from those possessions. None of the kickout recipients were under pressure when receiving the ball. Six further kickouts had gone past the 45 with the possession battle being 3-3. Donegal were unable to get the ball to players past the 45 in space but they were still being productive. That was until the Donaghy goal. Not only did the error cough up the goal but it spooked the team as well. Immediately after the goal Donegal kicked the next four kickouts long. Kerry won all four scoring 0-02. Of Kerry’s 19 kickouts five went short with Kerry gaining possession each time. When the ball went past the 45 Donegal won the possession battle 8-6. The most recent memory we have of Kerry’s attack is their semi final replay against Mayo in Limerick which also happens to be their worst outing to date. The surprise is not that they had a bad day against one of the best defences in the country but rather that it was so poor compared to their returns against the same team six days previously. Taking the season as a whole (the four point win over Clare was not shown) their attacking play has been outstanding. They have created above average attacks in each game whilst also posting, on average, a shot rate of 82%. Though in the context of meeting Donegal the average of the two Mayo games (75%) might be a better marker. What has been extremely impressive is their shooting. Despite a poor performance the last day out they have maintained an average of a 58% Success Rate with a corresponding high weighting. Due to the nature of how they sit back Donegal do allow the opposition to have the ball within their 45. Whilst Kerry will not be at Dublin’s pace (no other team is) they can expect to do as well as, if not better, than Monaghan & Armagh here. Those two averaged 36.5 attacking possessions whilst Kerry averaged 39 in their two encounters against Mayo. Let’s go with a mid-point of 38 Kerry attacks. So if we assume 38 attacks with a 73% Shot Rate that gives Kerry 28 shots. Donegal have allowed the opposition to score at a range of 43% to 55% though they have tightened up in their last three games. We know Kerry are one of the most accurate teams and despite their poor outing against Mayo in the replay they have maintained a Success Rate of 58%. For this exercise I think it is safe to pick at the higher end of the range that Donegal allow. If Kerry can hit 50% then they score 14 times (0-14, 1-13, 2-12). For every 2% increase in accuracy they increase the outcome by 0.5 scores – so hit their average of 58% and the return 16 scores (0-16, 1-15, 2-14). Apropros of nothing – in the 2012 QF Kerry’s stat line was 33 possessions & 23 shots (a 70% Shot Rate) with a Success Rate of 48%. Whilst the above numbers are very impressive they become even more so when you strip out goal attempts. We will see in the Donegal piece below that their goal shots are “masking” some average point taking. The opposite is the case here. Kerry have attempted 14 shots at goal converting five to a score. When going for points they are running at a 57% Success Rate (58 from 101) and a combined weighting of +10.180. O’Donoghue is the marquee forward – and with good reason. He has taken 25% of Kerry’s point attempts whilst maintaining a quick staggering 76% accuracy rate. He was slowed down by Mayo (54% Success Rate with a weighting of +0.656) but that was due in no small part to two man marking performances that will in all probability earn Keith Higgins an All Star. Donegal can produce such performances (McGee inside or Lacey outside) but they will need to. If O’Donoghue gets the ball he has the accuracy to punish. But it is not just O’Donoghue who is accurate. Himself and Geaney are the only players to take double digit shots but despite this the rest of the team have a combined 56% Success Rate. The team as a whole has the ability to score if the opportunities are taken from O’Donoghue. This is the one area of weakness that Kerry’s attack has shown to date. The above table is for frees only however if we include the other four deadballs that they attempted (2x penalties plus 2x 45s) then the Success Rate comes in at 66.7% with a weighting of -1.158. This is essentially bang in line with the ’12 & ’13 averages (also 66.7%) however the low weighting indicates that the ones missed were on the easier side. A word of warning though – whilst the weightings being so poor should ring alarm bells some might draw comfort from the Success Rate being average. I haven’t collated the data for 2014 yet but through 19 games the Success Rate for deadballs has jumped to 74%. This is provisional at the moment but shows how far behind the Kerry deadball striking has been this year. Viewed as a whole there is nothing noteworthy about Donegal’s attack. This however masks the one game potential that this team possesses. The two highest Success Rates within a game belong to this squad – the 68% recorded in the semi final against Dublin and a 67% against Tyrone in 2013. Both were achieved from a below average number of shots (indeed the 67% against Tyrone came from a paltry 18 shots). Of course if your shooting boots are not on when producing a low number of shots you can get yourself into all sorts of trouble – exhibit A being the Ulster final last year where Donegal only managed seven scores from 21 shots (33% Success Rate). Which Donegal attack will we see? The accuracy evident against Tyrone & Dublin or the wastefulness we witnessed in the Armagh and Monaghan (2013 version) games? Much has been made of the Donegal defence and how they defend. Kerry may not be a traditional blanket defence team but they restrict the amount of attacks the opposition has. This is done in two main parts – firstly they do drop players back (think of Galvin in previous years and Declan O’Sullivan/D Walsh this). Secondly they use their inate kicking skills to restrict the opposition’s time on the ball – another very adept way of lowering the opposition’s attacks. In the Cork & Galway games they went 25 & 31 minutes without giving a pass away. Donegal are not the only team capable of enforcing their tempo on a game. Recency bias may be at work in how we view Donegal’s attack. Their 75% against Dublin in the semi final is by far the best we have seen this year – but it is only one game removed from their abysmal outing against Armagh. As a whole their shooting from play appears to be quite good with a healthy overall average and above average returns in four of their five games. Their accuracy when going for goal has greatly helped this however. In 2013 goal shots were converted at a 31% clip. Donegal have had 14 attempts at goal in this year’s campaign managing to score 8 goals (a 57% Success Rate). Not alone that but they have also scored 4 points from those 14 shots – so their goal shot tally this year is a Success Rate of 86% (12 from 14) with a weighting of +5.997! Very impressive. The flip side of this of course is that when they go for points the returns are not so healthy (a combined Success Rate of 45% and a weighting of -1.597). Four players, namely MacNiallais, McBrearty, Murphy & McFadden account for 57% of all of Donegal’s point attempts and their individual results are below. McFadden has struggled all year with the semi final outing, where he converted two chances from inside the 20m line, being his best day out. From afar it would appear that it is not only Kerry who have been struggling with free kicks this year. In their march to the title in 2012 Murphy & McFadden recorded a combined Success Rate of 78% from all deadballs. They have dropped off that rate this year however this can, in part, be attributed to Murphy’s long range free taking. He has had seven attempts, some of them quite outrageous, from outside the 45 converting two. This leaves a success rate of 78% for frees inside the 45 – much healthier and along the lines of what we would expect from the duo. In their four games to date Kerry have conceded shots from frees on 26 occasions (6 v Cork, 4 v Galway and 8 in both of the Mayo games) – 23 inside the 45. That equates to 5.75 “scoreable” frees a game. Given Donegal’s prowess from frees inside the 45 Kerry will want to ensure that no more than six kickable frees are conceded. In that piece we noted how O’Connor was on the ball a lot less because he played closer to goal. 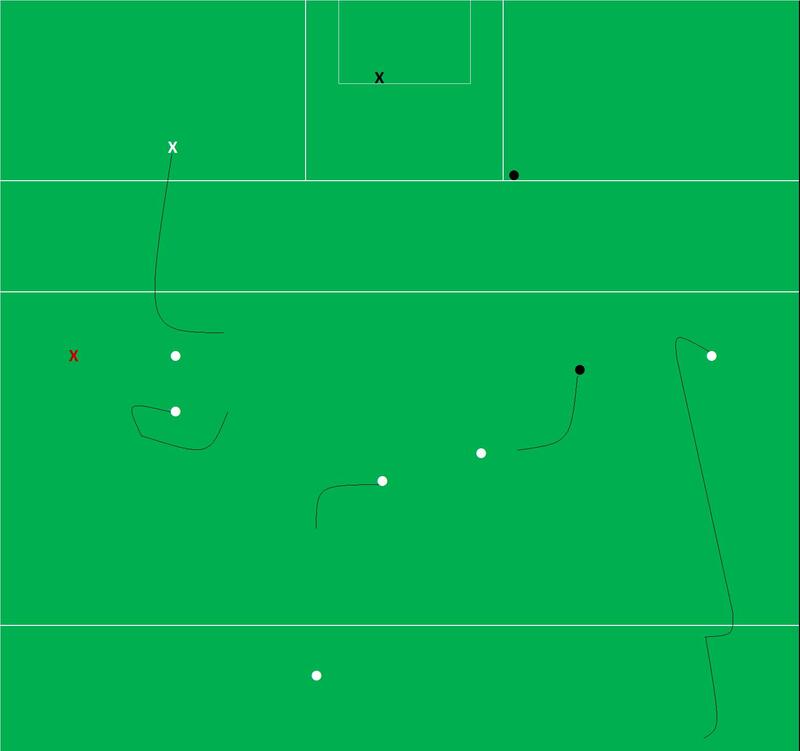 Below is O’Donoghue’s chart from the subsequent replay – he obviously played closer to goal but such is his form at the moment that his volume of touches hardly dropped. In the original game O’Donoghue seemed to have a free roaming role with his touches effectively forming a horse shoe around what could be deemed the scoring zone. When he did step inside that zone he took a shot. 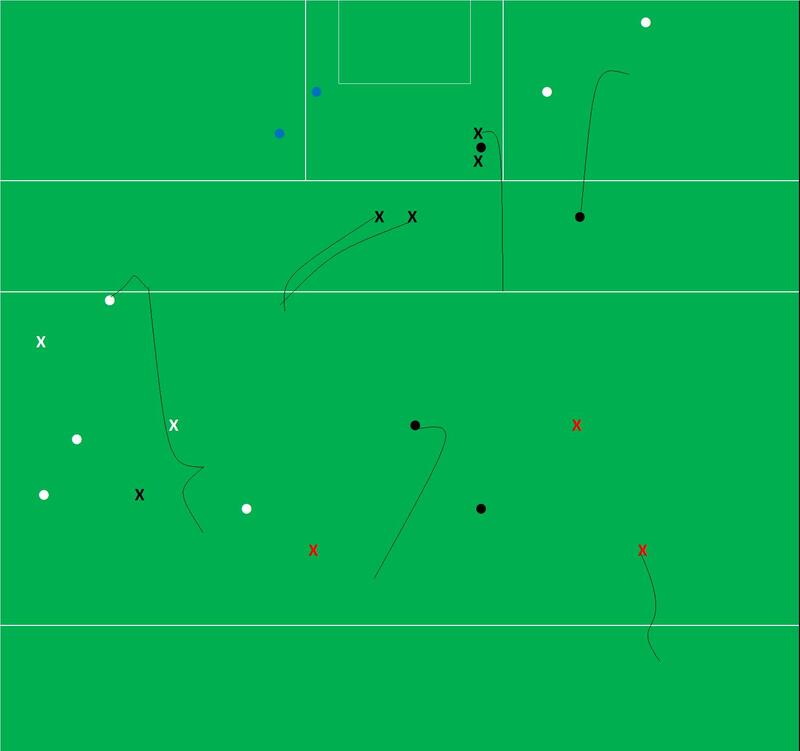 In the replay his touches were much closer to goal – 10 inside the 20m line as opposed to 5 in the drawn game. He maintained his volume of touches (24 in the original game, 22 in the replay) but the impact of those touches increased – his shot count increased from 6 to 9 whilst he also drove towards goal more effectively. I have no doubt that the change in where on the pitch he received the ball was attributable to Kerry starting Kieran Donaghy at full forward. With Donaghy there Kerry needed a foil closer to him to ensure full value was gained from the organised chaos he can create. But which O’Donoghue do Kerry need in the final? The shooter closer to goal, where O’Donoghue runs the risk of being ensnared in Donegal’s defensive net, or the playmaker further out the pitch who will be on the ball in more space? If O’Donoghue plays out the pitch does that negate some of the advantages of starting Donaghy? All three were effectively snuffed out as an attacking threat by Donegal. The three touches for Brogan inside the 20m line were all in the first 15 minutes when Dublin were on top – thereafter he had to come outside of the 20m line to get on the ball. Whilst he was very willing to do what was needed to influence the game, as evidenced by how much movement he did when he was on the ball, Donegal effectively shepherded him away from the scoring zone. His impact was minimal. Clarke missed a point attempt in the 3rd minute, which he really should have converted, as well as off loading two hand passes for shots in the first twenty minutes but after that, much like Brogan, his influence wained. Although he started the first half further out than Brogan he also had to go wandering in the second half to get on the ball – four of his six second half touches were no nearer than 38m from goal – and much like Brogan he could hardly get on the ball at all inside Donegal’s 45 in the final 25 minutes. Monaghan effectively played Kieran Hughes up front on his own for much of the game so McManus’s attacking forays were very limited. O’Donoghue will not be asked to do as defensive a role as McManus nor will he be as isolated when he does get the ball. I think we can dismiss the McManus comparison. Brogan & Clarke’s roles, further out the pitch, were similar to O’Donoghue’s in the drawn game but without the end product. None of the three could get in close to goal however. So what do Kerry do? Play O’Donoghue out the pitch, where he can get his hands on the ball, and thus try and have a greater impact on the game or play him closer to goal as a Donaghy foil, like the semi final replay, in the knowledge that his touches will be reduced but not knowing just how reduced they will be? So the Donegal plan, going in to the game, was simple. Defensively use the first 25 minutes in the Monaghan game as your template and maintain that for 70 minutes. Offensively – take every opportunity that came your way. Well on the offensive side Donegal followed this to a tee. A 68% Success Rate is the best recorded in the last three year’s worth of Championship games (c75 games & 150 teams at this point). But we knew that Donegal could do this – the record prior to this game was their own 67% Success Rate compiled against Tyrone in their opening encounter last year. On the defensive side they kind of followed the script. Below are Dublin’s averages in the four Championship games to date compared against how Donegal fared. Donegal did not stay on the Monaghan trajectory (that was projected to be 42 attacking possessions) but they did limit the attacks Dublin had and managed to keep their Shot Rate to an average level. This meant that Dublin managed a full 6.5 shots less than they had averaged to date. A mixture of Donegal pressure (both in terms of on the shooter and where they allowed Dublin to shoot from) as well as scoreboard pressure ensured that Dublin’s accuracy was also well down on where it had been previously. Lower attacks + lower Shot Rate + lower Dublin accuracy still equalled 17 points. But it was enough to keep give Donegal an achievable target and once they got into gear they flew. Getting 3-01 from four attempts on goal doesn’t do any harm either. As exceptional as Donegal’s shooting was – it could have been better! Four of their five misses were very central (see shot chart below) with Murphy, Toye & McHugh all dropping shots into Cluxton’s hands. The fifth miss from McFadden, inside the 20m line on the left, was also one he’d like back. That of course is nit picking. Donegal were, as a team, exceptionally accurate though their Success Rate was helped by the shots they took. Only McBrearty took a shot from outside the 20m line in the second half whilst only three shots in the entire game could be deemed to be outside the optimal shooting zone (and they converted two!). Dublin’s shooting returns may come as a surprise but there was a real split in both their accuracy and their shot type between the two halves. When going for points in the first half Dublin recorded a Success Rate of 67% (10 from 15) with a weighting of +3.528. They were taking, and converting, multiple long range shots – 5 of their points came from central shots c40 metres out (out of six shots). In the second half their long range point taking disappeared. Never mind 40 metres out only one shot was attempted from further out than the top of the D. They stepped into the traffic where the Donegal defence was and thus 55% (6 out of 11) of their point attempts were taken under pressure. In the second half their point taking was 45% with a Success Rate of +0.564. Average but not the stellar heights they hit in the first half. Then there were the goal chances. Whereas Donegal hit 3-01 from their four goal shots Dublin missed all five of theirs. Apart from the execution perhaps the strangest thing is that in the second half, when they were chasing the game, this goal hungry team didn’t have an attempt for a goal until the 66th minute. Another notch on Donegal’s defensive belt. A very poor return from Dublin converting only 27% of their chances. Admittedly Cluxton’s three attempts from the right were of the more difficult variety but on average one in three of those are converted. For a player of Cluxton’s ability you expect one to be converted and hope for two. Brogan’s chances were much easier. He converted the attempt from in front of the posts but missed the two from the left. Combining this year’s four games, and the six games in 2013, Brogan was running at an 88% Success Rate (21 from 24 on deadballs). Undoubtedly the majority of those were taken when well ahead … perhaps the two he missed, when Dublin absolutely needed them, were the best examples of the pressure the game situation had created. Donegal’s discipline in defence is something we’ve touched on time and again but to only give away four frees inside the 45, considering the volume of attacks they faced, was immense. Not much between the teams here. Considering how many attacks Dublin had, and thus how often they met the Donegal defence, it was a good effort to only lose the ball 16 times through a tackle or a misplaced pass. The overall quality of play was quite high. The total number of turnovers at 47 is on the lower end. In their two semi finals Kerry & Mayo averaged 56.5 (over 70 minutes). Dublin dominated their own kickouts. Cluxton was too quick for the cameras on four of the 23 kickouts. Of the other 19 Dublin went short with seven (37%). They carried the ball into Donegal’s 45 on six occasions with three points resulting from four shots. Donegal’s three wins all came from kickouts that landed past the 45 but even here, when the defending team is more favoured, Dublin still won the possession stakes 8 – 3. Donegal were not as interested in the quick kickout as Dublin and as such the cameras only missed where one landed. This also had a knock on effect on how often they went short. Only three (10%) of their 30 kickouts went short – and Dublin managed to win one of those. Early in the first half Donegal had an excellent outlet to MacNiallais on the left in the “mid” range (between the 45 and 65). He was found three times but Dublin closed off this avenue soon after and only two more kickouts were hit to this mid range thereafter. That leaves the vast majority of Donegal’s kickouts going long – 73%. Donegal struggled early losing six of the first seven – they just couldn’t get their hands on the ball thus enabling Dublin’s initial attacking onslaught. After this though they got a grip and won the next 15long kickouts 10-5. All data below includes Extra Time unless otherwise stated. Over the 90 minutes Kerry just had too many attacks for Mayo. It was Mayo’s efficiency in normal time that produced Extra Time (84% Shot Rate and 54% Success Rate in 70 minutes) but they were always relying on eeking the most out of minimal attacking ball. There are no reference points for what *should* happen in extra time but above are the returns. Mayo had the attacking possessions to inflict damage on Kerry but they could not maintain the aforementioned efficiency – indeed they went c14 minutes of playing time without a shot in Extra Time with O’Connor’s desperate goal attempt at the end of the match being their only shot in the second half. 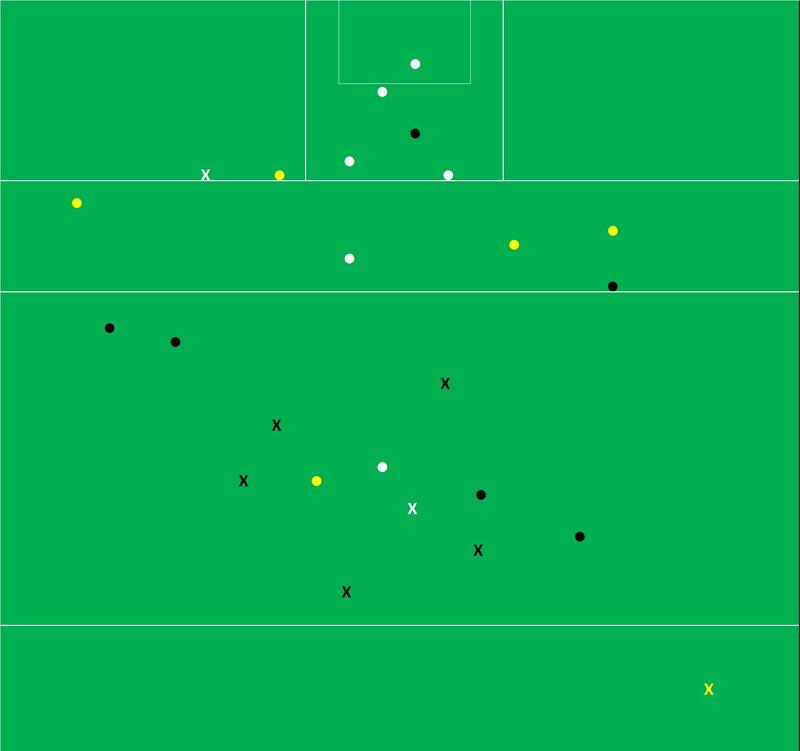 In the Croke Park encounter the teams’ created their attacks from very similar areas – indeed the only real difference was that Kerry created two attacks from the throw Ins. In Limerick on Sunday there was some daylight – Kerry created eight more attacks from kickouts. We’ll go into more detail on the kickout section below but ultimately it was these extra attacks that allowed Kerry to be so profligate from play and yet still come out on top. After praising Kerry’s shooting from play the last day they throw in an absolute stinker. That is a very un-Kerry like stat line. In three Championship games prior to this one Kerry’s combined Success Rate from play was 62.4% with a weighting of +13.178. They had been imperious – and had hit 63% against the same defence six days previously. There did not appear to be anything untoward in the shots they were taking. Nothing that would lead to such a negative return anyway. I charted only 37% (11 from 30) of shots occurring under pressure whilst the shot charts below show that none of the attempts were from ridiculous angles. Their poor returns would appear to be just one of those days. The majority of the poor shooting can be laid at the door (feet?) of what might be considered the support cast in terms of shooting. Of the seven players that attempted one shot for a point only Killian Young converted. The likes of O’Mahony, Sheehan, M Geaney & Crowley all missed fairly central shots. Whilst Mayo’s returns are at best efficient their problems were outside that of mere execution. Shot selection was one. They attempted six shots from outside 30m whilst also attempting another six from wide positions inside 30m. Twelve shots outside what might be deemed the optimal shooting zone with only two points to show for it. Options was another. Their forward unit has been much maligned but in a way it was the lack of any other option that hindered them. Of the 22 shots from play over 90 minutes only four came from outside the starting six forwards- Keegan, Conroy & Vaughan x2. Kerry converted 9 out of 10 deadball attempts with the only miss coming from a Moran 45. A 90% Success Rate, when compared to the average of 67%, is excellent though the percentage is padded to some extent by the nature of the deadballs. O’Donoghue’s penalties were dispatched with aplomb but we know that over the past two years 88% of penalties have been converted. Also all of BJ Keane & P Geaney’s frees were taken from close in to goal where a c93% Success Rate is expected. Only an egregious error, or a wonderful save, would have resulted in seven of those deadballs not being converted. O’Connor’s returns may appear poor, given his status as a supreme marksman from deadballs, but again the Success Rate and weighting are negatively affected by his attempt at a goal with Mayo’s last shot at the end of extra time. Remove this and his returns are basically average (Success Rate of 67%, weighting +0.338). Up until this weekend O’Connor had been converting deadballs at an 80% clip but four of his five misses had been from around the 45m line and further out. This of course implies that he was nearly flawless inside the 45 – 20 from 21. It was a similar story here. O’Connor converted all three frees (as well as the penalty) from inside the 45 but missed a 45 and a long range effort from the left. In the drawn game the teams could not be separated in terms of turnovers. Over the 70 minutes in this game the two teams were more careful with the ball – 52 total turnovers in the 70 minutes versus 61 the previous day. Whilst each team’s volume of turnovers was very similar Kerry were more clinical at converting these turnovers to shots. This was not necessarily helped by easy turnover ball either – only twice did they receive the ball inside Mayo’s 65. Mayo’s press defence was in effect again (4 turnovers inside Kerry’s 65 whilst also getting their hands on a short kickout) but Kerry in the main were good enough, and intelligent enough, footballers to get away with the ball. Kerry managed 5 more shots from the kickouts they won. This was not through a better use of the ball, as their kickouts won to shot percentage is very similar to Mayo, but rather due to the sheer volume of kickouts won (+8 overall). The first day out we noted that Mayo broke even on kickouts due to their judicious use of the short kickout. When the ball was kicked beyond the 45 the lost the battle 20-15. I’m not sure if it was the dimensions of the pitch, or whether Kerry were much more effective at pushing up, but Mayo only used the short kickout twice in 90 minutes here. Given what happened in the first game, and the fact that they were struggling so much in this one on their own kickout (losing kickouts landing beyond the 45 17-10) that decision seems strange. From a Kerry perspective they will be slightly disappointed, given the large advantage they had in the first game, and on Mayo’s kickouts, with their own kickout performance. They went short four times (losing one early) so of their 25 contestable kickouts they only won the possession battle 13-12. James O’Donoghue & Cillian O’Connor are two of the best forwards in the game and their play had a huge bearing on the semi final. The below charts where they got on the ball with a quick review of the impact their interventions had. •	O’Donoghue tackled Vaughan out over the sideline in Kerry’s half just after Keegan’s red card. This sideline possession led directly to Fitzgerald’s point. •	O’Connor fouled Walsh inside his own half slowing down a second half attack. He was also instrumental in two turnovers that led to Mayo points. O’Donoghue was much more involved in open play getting on the ball 24 times. The charts below show that he had much more of a roaming role than O’Connor, getting the ball in a horse shoe around what might be considered the prime shooting zone. Once he was inside that zone he pulled the trigger. Of his 24 possessions O’Donoghue only gave the ball away three times – the cross field sideline ball in the first half, the missed pass when Walsh looked through on goals and once when A O’Shea dispossessed him in the tackle. Indeed that tackle from O’Shea appeared to affect him for the rest of the first half as his *only* contribution was winning Geaney’s easy free from the 13m line under Vaughan’s sliding challenge. The other foul was a silly tug by Cunniffe on the 45. His passing was secure with a success rate of 87% (13 from 15) whilst one of his passes was a direct assist to a P Geaney shot. Another kick pass was instrumental in Walsh’s point in the second half. O’Connor’s deadball striking was of vital importance to Mayo but removing those he was on the ball 12 times. Two of those 12 were short passes, in the top left corner, that occurred in the 69th minute when Mayo were trying to protect their one point lead. That leaves ten times that O’Connor was on the ball, in play, which would appear to be very few. It was what he did with those ten that made his contributions so vital. We can see that he converted three of his five attempts at a point whilst was inches away from getting the opening goal with his sixth shot from play. Of his four passes two were vital flicks that led to a teammate’s point (both to Dillon incidentally) whilst a third was a quick free kick that led directly to one of his shots. Only one of his ten touches was not a shot nor did it lead directly to a shot. •	12:40 – he received a short kickout from Hennelly. I have no idea what he was doing back there but he had the intelligence to realise he could help out by making himself available rather than running straight back up field. •	45th minute – perhaps the most instrumental minute in the championship yet. Lying on the ground he managed to scramble a kick pass to Dillon in space who pointed the subsequent shot. After the kickout he dispossessed O’Mahoney on his own, got a quick return pass and then fired over a point from 43 metres. A relatively even set of numbers as befitting a high quality draw. The shooting from both teams was of the highest order. In the Cork game Mayo created 50 attacking possessions becoming, incidentally, the only team outside Dublin to achieve that figure. 37 attacks here may seem on the low side (granted they were down to 14 men for half the game) but that does not take into account the opposition. Kerry are past masters at controlling the tempo of the game. In the previous 6 Championship games, stretching back to 2013, they have allowed 41, 26, 39 (Dublin), 33, 30 & 27 attacks. Part of how they restrict the opposition’s attack is by controlling the clock. A small illustration of that control could be seen in how they manufactured Fionn Fitzgerald’s point after Lee Keegan’s red card. Kerry took a quick sideline ball in their own half. 84 seconds, and 17 passes later, Fitzgerald popped the ball over the bar. Simple, effective and keeps the ball out of the opposition’s hands. Where the two teams do differ is in the half splits. Down to 14 men Mayo absolutely blitzed the second half creating three more shots than Kerry whilst also converting a ridiculous 71% of shots. The best Success Rate recorded to date is Donegal’s 67% against Tyrone in 2013. Although the 71% is only for one half producing that quality and accuracy, whilst down to 14 men, is phenomenal. Again incredibly even – indeed Kerry producing an attack from both throw ins is almost the only difference. Much was made of Mayo’s high press against Cork and whilst it was in evidence here (5 turnovers inside the Kerry 65 resulting in 0-04) Kerry matched the volume if not the conversion to scores (4 turnovers inside Mayo’s 65 resulting in 0-02). For the third game this year Kerry produced a Success Rate above 60% (61% V Cork; 63% V Galway). Their shooting this year is consistently brilliant – and this without Cooper. O’Donoghue is a combined 78% (18 from 23) over the three games but the support staff are also shooting at an excellent clip – 56%. To be hitting 56%, given that the average is 45.4%, whilst excluding your two main marksmen, is exceptional. A large part of Kerry’s success in this department is their shot selection. Looking at the shot charts below there are very few wild shots – nothing is wasted. On top of this Kerry take fewer shots under pressure than is the norm. In this game 38% (9 from 24) of their shots were taken under pressure which continues the trend observed in the previous two games this year. An excellent day’s work from O’Connor with his only miss being from outside the 45. This was not entirely unexpected as of his four misses prior to this game three have been along the 45m line. Still he is on excellent form with a combined Success Rate of 80% (20/25, weighting of +2.277) in four games. Undoubtedly O’Connor’s most important conversion was the penalty. It was a wonderful strike, hit hard and with conviction, but the outcome was not entirely unexpected. Over three Championship seasons 88% of penalties have been converted. Not wishing to be repetitive but … again incredibly equal. From the volumes of turnovers received to the nature by which those turnover were achieved everything is of a fairly equal nature. The only real difference was in the ‘other’ grouping. Two of Kerry’s seven were attributed to Walsh fouling the ball under immense Mayo pressure whilst I have M Geaney tagged for mishandling the ball three times. Mayo went short with nine (36%) of their kickouts converting three to a shot. Of the remaining 16 Mayo “won” the possession 9-7 but this masks a difficult final ten minutes. Kerry won four of the last five contested (landing beyond the 45) kickouts. Indeed their goal came from a Mayo kickout. Kerry went short on five (20%) of their kickouts converting three to a shot. Of the remaining 20 Kerry “won” the possession battle 13-6. So whilst the overall outcomes look very similar Mayo were only able to stay with Kerry in this department through the judicial use of the short kickout. Given their general strength in this area (they won “contestable” kickouts 20-15) it is somewhat surprising that Kerry didn’t push up more on Mayo’s short kickouts. Especially with an extra man. Case in point was the short kickout executed by Mayo after Crowley’s fisted point. Kerry were four points down with six minutes to go and needed the ball. It was not as if they didn’t have time to set – 26 seconds elapsed between the point being scored and the kickout being taken. Kerry really needed to force Hennelly to kick long in that scenario. Not much of a contest once the goals went in however Dublin will be once again be pleased with their overall returns. This is the fourth game in a row where they have produced a Shot Rate of 80% or greater on 50 or more attacking possessions. This means that over the four games their lowest volume of shots has been 42. Maintain that going forward and, even converting at an average rate, without goals, that equates to a minimum score of 0-21. Looking forward it is interesting to review how Monaghan did prior to the first goal. The numbers show that they were definitely keeping Dublin in check; Dublin had 14 possessions and 10 shots (71% Shot Rate) in that period. This equates to 42 possessions & 30 shots over a 75 minute game (allowing for injury time). Monaghan were placing Dublin under pressure when shooting to the extent that they only had a Success Rate of 30%. An example of this pressure was when B Brogan appeared not to have any options from a sideline so attempted a point. A 30% Success Rate on 30 shots would be a score of 0-09 or 1-08. Remember also that after 28 minutes Laois were 0-08 to 0-06 up against Dublin. They too had held Dublin in check with a 78% Shot Rate (14 shots from 18 possessions) and a Success Rate of 43% (though Dublin did go for goal early in that game). Between the two let’s say that Donegal keep Dublin to a shot rate of 78% on 42 possessions with a 43% Success Rate. That equates to a Dublin score of 0-14 or 1-13. Definitely keeps them in the game. This is the ultimate “what-iffery”, and there are huge questions around whether a team could keep the discipline & intensity required over 75 minutes, but I have no doubt that it is this story the Donegal back room team are spinning in the build up to the semi final. As ever there are two main areas by which you can start attacks; kickouts & turnovers. We will see below that both teams created the same volume of turnovers but Dublin were better in the transition phase getting 25 attacks from their 31 turnovers as against 17 for Monaghan. Monaghan’s shooting was particularly poor but this is not a new phenomenon. Unfortunately I have not managed to review the Kildare game yet but in the last seven Championship games on the blog, stretching back to the start of the ’13 Ulster Championship, Monaghan’s highest Success Rate has been 44% (against Tyrone in ’13). A lot of focus is placed on Dublin’s phenomenal attacking prowess (guilty as charged!) but their defence stood up in the 25 minute prior to the goals. Monaghan attempted six shots from play in that spell with five of them occurring under heavy pressure. All five were missed. Dublin continue on their merry way. Remarkably, considering that the average number of shots from play over the past two years has been 20.3, the 33 shots posted here is the lowest of the campaign thus far. Of the 33 attempts five were for goal – bringing their four game average to 6.75 per game – thus leaving a Success Rate of 50.0% when shooting for points which is below their four game average of 51.7%. The goals had an effect on Monaghan’s intensity. Prior to Connolly’s goal Dublin had only attempted five shots from play missing all five. Four of them were taken under pressure (O’Gara’s fisted effort in to the goal was the fifth). After the goal Dublin attempted six shots from play before half time with five of them taken without any pressure. A relatively good day for Dublin converting 80% with Connolly converting one from the right. Highlighting Connolly’s attempt may seem strange but against Meath he missed two from that side. All involved will be happy to see this one converted. Brogan’s only miss was his sideline attempt. That was his first deadball miss of this year’s campaign (11 from 12 (92%) with a weighting of +1.641). In contrast to Donegal Dublin’s deadball shooting has improved considerably this year. In 2013 they produced a Success Rate of 66% in their run to the All Ireland (33 from 50) with a weighting of -0.161. Basically bang on average. This year they are running at a combined 82% (27 from 33) with a weighting of +4.211. Another string to their attacking bow! A quick nod to Monaghan’s deadball excellence. They were 100% against Dublin (7 from 7 with a weighting of +2.192) which continues the fine deadball striking they exhibited all season. For the four 2014 games on the blog they are running at an 80% Success Rate (28/35) with a weighting of +5.079. Very similar to Dublin you might say but if we exclude Beggan’s attempts – who attempts a high volume of low percentage long range efforts – they are running at a Success Rate of 86%. In the Armagh – Donegal QF there were 44 turnovers in the entire game. Here there were 62 and Dublin’s 4 games to date are averaging 57.25. No doubt scoreboard pressure leads to teams attempting passes they wouldn’t normally, or running into alleys in an attempt to get goals, but perhaps surprisingly Dublin give up as many turnovers as they receive (110 given up over four games with 119 gained). The “trick” is that they are much more adept at converting the turnovers they receive to shots than the opposition have been. There really wasn’t a contest on Dublin’s kickouts with 16 of the 23 going short. Monaghan stopped Dublin getting a shot off on the first four however as we have seen the life went out of their challenge thereafter and Dublin managed a shot from 11 of the remaining 12 short kickouts. The cameras missed where a number of the Monaghan kickouts landed but we can assume that the majority were short. Of the remainder Dublin managed to apply a huge amount of pressure to Monaghan’s contestable (landing past the 45) kickouts winning 14 out of the 24. This doesn’t tell the full story however for they won 12 of the first 15 of such kickouts thus turning the screw on Monaghan once the initial gap in the scoreboard was established. Given the defensive nature of both teams it might be surprising to see so many attacking possessions in the game. But it is the defensive nature of the teams that leads to these high volumes – when the opposition has the ball they are allowed come forward and are only engaged somewhere around the 45. Thus attacking possessions are achieved quite easily. The low Shot Rates further emphasise this philosophy. In their three games to date Donegal have allowed the opposition Shot Rates of 71%, 71% and 64%. You may have the ball, even be allowed into the 45, but you will have to work extra hard for any shots you carve out. Given that Donegal manufactured eight extra shots they will be very disappointed to have only won by a single point. Whilst they were in control of much of the game, and looked comfortable, they never should have been in a position where a goal put them under such pressure. Their usual third quarter supremacy was in evidence (they were winning the second half shot count 10-3 at one stage) but their lack of accuracy meant that it was not shown on the scoreboard. Two things stand out from the above table. The first is how much more successful Donegal were at getting attacking possession from Armagh’s kickouts than was the case the other way around. The second is where the turnovers were received. Only 5 of the 31 turnovers that were turned into attacks emanated from outside either side’s 45. Unlike what Mayo did to Cork there was no real high pressing of defenders and no attacks, and thus points, were achieved cheaply. Very good shooting from Armagh, especially when you consider that only 4 of the 22 shots were taken from a central location. Tony Kernan (3 from 4) and Stefan Campbell (2 from 3) were the main protagonists. Looking at the shot chart below it is quite surprising to see that Tony Kernan’s long range effort in the first half was the only shot attempted from further than 35metres. Donegal “give” teams the wide channel, as they protect the central shooting area, and Armagh were content to shoot from there rather than try to tease the defensive shield out by shooting over it. Donegal’s shooting from play was atrocious. There’s no real way around it. And this despite the fact that they converted three of their last four attempts; up until then Donegal were running at a 20% Success Rate! We have seen poor shooting from Donegal before (they hit 21%, 3 from 14, in the 2013 Ulster Final) but not this year. In their three games on the way to the Ulster championship their returns from play have been 50%, 50% & 53%. I guess Donegal will write this off as “one of those things” and move on. Armagh, like the aforementioned Monaghan team in 2013, are a physically imposing team so some of this poor return could be attributed to them. Only 57% (13/23) of Donegal’s attempts at a point were done so under pressure however. Instead I would attribute a lot of the poor returns to poor shooting – Gallagher’s effort in the second half – and poor options – McGee’s second attempt from the right plus Murphy’s two very long range efforts. Yes Murphy can convert these attempts but would the better option have been to work the ball in closer as they did for the penultimate point? For 70 minutes Donegal showed excellent disciple in defence only allowing Armagh two shots at goal from frees. That collective discipline dissolved when the ball was kicked away to give Armagh that last opportunity but otherwise they can be pleased with their efforts. Murphy was having a very good day from frees until he missed a fairly routine free c40m out in front of goals with his last attempt. His weighting is badly affected by that miss. Similarly McFadden missed a central kick that badly affected his weighting but his was just inside the 45m line and to the right. For an area of their game that was such a strength in 2012 Donegal are returning below par performances this year. In the four games to date Murphy & McFadden are a combined 64% (18/28) with a weighting of -1.205. The nature of both teams’ philosophy can be seen in how few turnovers there were. A combined volume of 44 is quite low whilst both teams struggled to transfer the turnovers won into shots. Part of this was due to where the turnover ball was received – all bar one of the 44 turnovers were received in the opposition’s half. Now Donegal are known for their ability to transfer turnover ball into scores however against a team like Armagh, who are set up with a defensive mindset, the space to run into once the turnover was won was not there. Also due to their own setup nothing was scored easily … none of their 22 turnovers were won outside their 65. On the flipside Donegal only gave up three of their turnovers outside Armagh’s 45. Armagh were given nothing easy – the only turnover Donegal gave up in their own half was when Gallagher lost the ball in the tackle between his 45 & 65. Donegal, for the main part, were in control of their own kickouts. Of their 22 kickouts we did not see where 2 landed. Of the remaining 20 45% went short with Donegal manufacturing 5 shots and scoring 0-01. On the eleven that were contestable (dropped past the 45) Armagh “won” the initial possession battle 6-5. Surprisingly for three of Armagh’s wins Durcan managed to pick out an Armagh player standing on his own. Armagh had a much tougher day on their kickouts only winning 50%. Given this fact it was surprising that Armagh went short only four times (we didn’t see where two of the kickouts landed). Of the 22 contestable kickouts Donegal won possession 13 times getting a shot off on nine of them. Armagh managed seven shots from the nine possessions they won – which is a good return – however they would have been better taking a few more short kickouts thus depriving Donegal of attacking ball inside the Armagh 65 whilst also ensuring more attacking possessions for themselves (given the low turnover rate they were attaining. Dublin blew Meath away but, from a Meath perspective, it could have been worse. Against Wexford and Laois the Success Rates were 60% & 55% respectively. Here Dublin’s shooting was of a more pedestrian nature thus, remarkeably, keeping the score in check. What is remarkable is the very high Shot Rates that Dublin are maintaining. 84% here after 82% and 80% in the previous two games – all on attacking possessions in the 50s. Dublin continue to get a phenomenal amount of ball inside the opposition’s 45 and continually produce shots from that possession. 41 shots from play is verging on ridiculous though. Looking at the Success Rate & weighting we see that it is the volume of their shots, rather than the forwards accuracy, that led to a big score here. This has not been the case when we look at the entirety of their Leinster campaign however. From play Dublin are converting at 48.2% (54 from 112 shots) with a combined weighting of +0.803. Against Meath they had eight goal attempts converting three (about average). Over the three games they are averaging 7.33 shots at goal a game converting 32% (7 from 22). Mixed bag from a Dublin perspective. Brogan was very steady whilst Cluxton chipped in with his customary 45. Connolly’s two misses were from wide on the right and whilst it should not be too big an issue – given the sheer volume of shots Dublin take – I’m sure the back room team would have liked to see one go over in case they are required in future games. Dublin managed to convert 71% of the turnovers they extracted from Meath into a shot. We have seen that their shooting was slightly off in this game however if they maintain that shot rate in games to come then turnover ball will be a huge component of their scoring. Once again an area of huge strength for Dublin. Meath did not use the short kickout (only going short on 5 of their 32 kickouts). Given this they had a respectable 17-10 “win” rate over Dublin on kickouts past the 45 however Dublin converted 90% of those wins into a shot. Meath could only convert 53% of their 17 wins to a shot.